Cumans (also known as Kipchaks in the East, Kuns or Comani in the West, and Polovtsi in Ukraine). Turkic nomadic tribes racially related to the Pechenegs. At the turn of the 10th century the Cumans inhabited the southern part of Central Asia as far east as the upper Irtysh River. After forcing out the Torks, the Cumans migrated in the mid-11th century through the Black Sea steppes as far as the lower Danube River. In Eastern sources this territory was known as Dasht-i-Kipchak (the Cuman Steppe), while in Rus’ sources only its western part was called the Land of the Polovtsians. The western Cuman tribes were in constant contact with Kyivan Rus’, Byzantium, Hungary, and Bulgaria. According to the chronicles, the first encounter between Rus’ and the Cumans took place in 1055 and resulted in a peace agreement. In 1061, however, the Cumans invaded the Pereiaslav principality and devastated it. In 1068, at the Alta River the Cumans crushed the combined forces of the three sons of Yaroslav the Wise—Iziaslav Yaroslavych, Sviatoslav II Yaroslavych, and Vsevolod Yaroslavych. From then on the Cumans repeatedly invaded Ukraine, devastated the land, and took captives whom they either kept as slaves or sold at slave markets in the south. Pereiaslav principality, Novhorod-Siverskyi principality, and Chernihiv principality were the most exposed regions. The Cumans inflicted the gravest losses on Ukraine at the end of the 11th century under the leadership of Khan Boniak, who was represented as a sorcerer in the Rus’ folklore of the time. The divided Ukrainian princes could not organize a common defense against the invader. Some of them, for example, Oleh (Mykhail) Sviatoslavych of Chernihiv, even sought aid from the Cumans in their internal squabbles. Only Volodymyr Monomakh, who at first ruled the Pereiaslav principality and then Kyiv principality, began to organize a common Rus’ coalition against the Cumans. As a result of an agreement reached at the Dolobske council of princes, several joint campaigns into the Cuman steppes took place, in 1103, 1109, and 1111. The nomads were defeated and pushed back to the Volga and Subcaucasia. After the death of Monomakh's son Mstyslav I Volodymyrovych (1132), who had successfully continued the policies of his father, the Cumans again became a threat to the Kyivan Rus’ principalities, although not as severe a threat as before. The Cuman encampments again moved up to the borders of the principalities, and Cuman incursions reached a peak in the 1180s under the leadership of Khan Konchak. The Ukrainian princes responded with joint campaigns in 1184–94. Although the separate action of Prince Ihor Sviatoslavych in 1185, which is described in the epic Slovo o polku Ihorevi, was a setback, the general outcome of the campaigns was favorable to the princes. Prince Roman Mstyslavych scored decisive victories over the Cumans in 1202 and 1204, which permitted Ukrainian colonization to expand about 100 km southward. During the century and a half that the Cumans harassed Ukraine they did not form a state or even a common alliance of tribes. The basic unit of their society was the family, which consisted of blood relatives. Related families formed clans, which lived together in movable settlements called ‘Cuman towers’ by Kyivan Rus’ chroniclers. The tribes were larger social units that were led by khans. Each tribe had its own name, and their names—Toksobychi, Burchevychi, Yeltunovychi, Yetebychi, etc—are often mentioned in the Ukrainian chronicles. The various tribes were also distinguished by the territory they controlled. Thus, the seashore Cumans lived in the steppes between the mouths of the Dnipro River and the Dnister River; the coastal Cumans, on the coast of the Sea of Azov; the Dnipro Cumans, on both banks of the bend in the Dnipro Valley; and the Don Cumans, in the Don River Valley. Animal husbandry was the main occupation of the Cumans. They raised horses, sheep, goats, camels, and cattle. In summer they moved north with their herds; in winter, south. A few of the Cumans also engaged in farming and trading and led a semisettled life. The main exports of the Cumans were animals, particularly horses, and animal products. The Cumans also played the role of middlemen in the trade between Byzantium and the East, which passed through the Cuman-controlled ports of Surozh, Oziv, and Saksyn. Several land routes between Europe and the Near East ran through Cuman territories: the Zaloznyi route, the Solianyi route, and the Varangian route. Cuman towns—Sharukan, Suhrov, and Balin—appeared in the Donets River Basin; they were inhabited, however, by other peoples besides the Cumans. Crafts were poorly developed among the Cumans and served only daily needs. 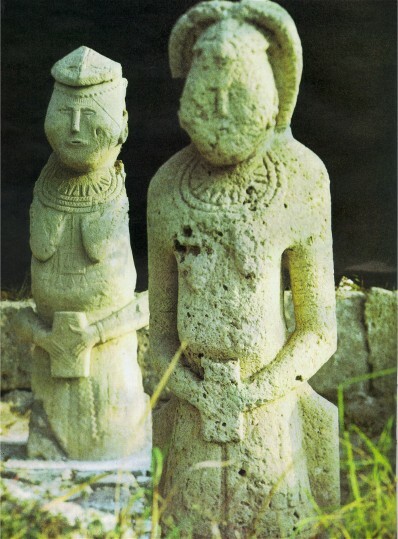 Primitive stone figures called Stone babas (see Stone baba), which are found throughout southern Ukraine, were closely connected with the Cuman religious cult of shamanism. Like other Turkic tribes, the Cumans tolerated all religions; hence, Islam and Christianity spread quickly among them. As a result of their proximity to the Kyivan Rus’ principalities, the Cuman khans and prominent families began to Slavicize their names, for example, Yaroslav Tomzakovych, Hlib Tyriievych, Yurii Konchakovych, and Danylo Kobiakovych. Ukrainian princely families were often connected by marriage with Cuman khans, and this tended to dampen political conflicts. Sometimes the princes and khans waged joint campaigns; for example, in 1221 they attacked the trading town of Sudak on the Black Sea, which was held by the Seljuk Turks and which interfered with Rus’-Cuman trade. Mongol forces led by the warlords Subutai and Jebe crossed the Caucasia in pursuit of Muhammad II, the shah of Khorezm, and defeated the Cumans in Subcaucasia in 1220. The Cuman khans Danylo Kobiakovych and Yurii Konchakovych fell in battle, while the others, led by Kotian (Sutoiovych) (Mstyslav Mstyslavych’s father-in-law), obtained aid from the Rus’ princes. The Rus’-Cuman forces were defeated, however, by the Mongols at the Kalka River in 1223. During the second Mongol invasion of Eastern Europe in 1237 the Cumans were defeated again. Most of them surrendered to the Mongols, while the others followed Kotian to Hungary and Bulgaria, where they assimilated into the local population. The Tatars became masters of the steppes of Ukraine. Although the Cumans were crushed, their cultural heritage passed on to the Tatars. The Mongol upper circles, being a minority, adopted from the Cumans much of their language, traits, and customs, and the two peoples finally became assimilated through intermarriage. In the second half of the 13th and the first half of the 14th century the Cumans, together with the Tatars, adopted Islam. A referral to this page is found in 81 entries.